Heavy duty 1 in. frame makes this display strong enough for your heaviest products. 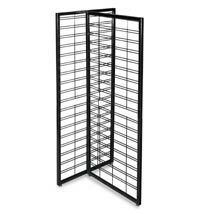 Accommodates slatwall and grid shelves and accessories. Display measures 24 in. wide x 24 in deep and available in 57 in. high or 84 in high. Ships unassembled to save on shipping.